Disclaimers are common defense measures used by companies and small business owners to protect themselves from legal claims that may be made against them. 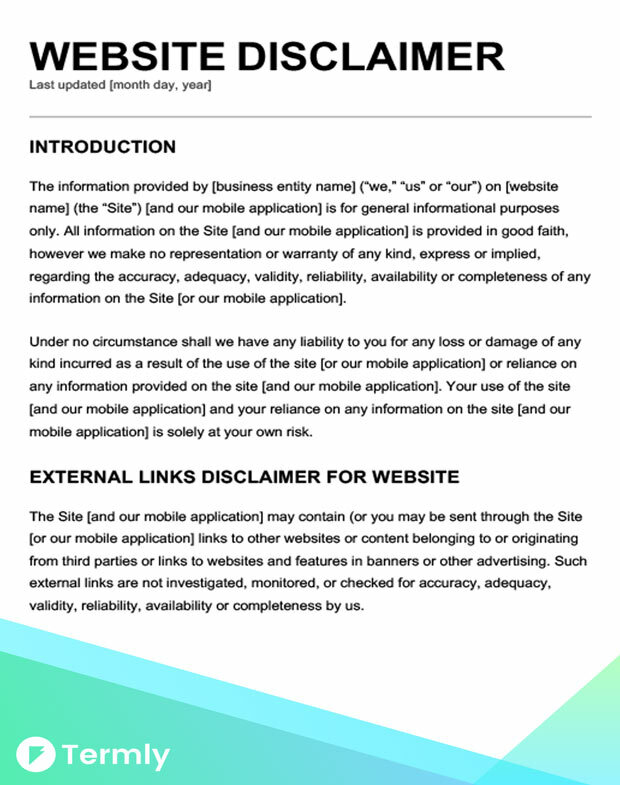 If you need one for your website or online business, see our free downloadable templates, or create your own with our fast and easy disclaimer generator. Click the following image to view the documents. 2. What Is A Disclaimer? 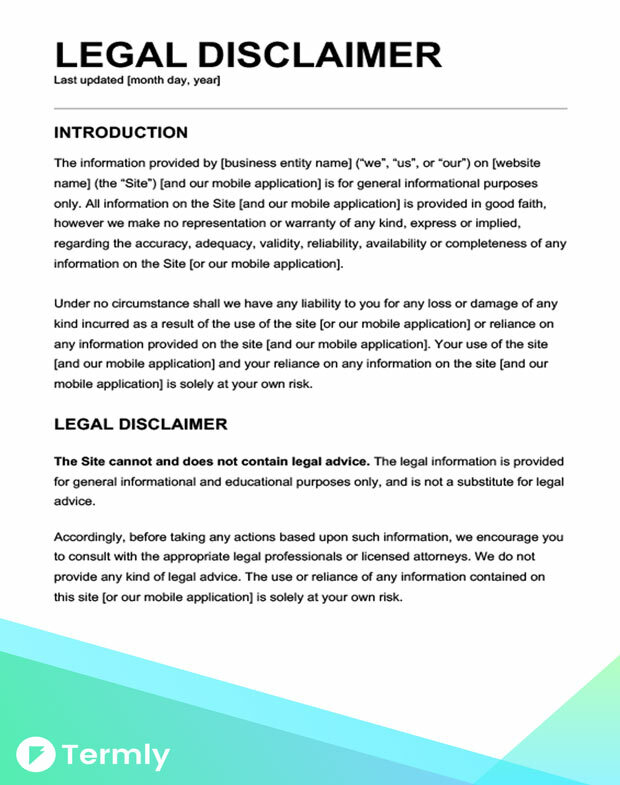 Because disclaimers operate as a legal safeguard, it’s important that they are visible and accessible to users; if they are not easy to find, or are deceptively placed on a webpage, there could be legal repercussions. This is why many online businesses include theirs on a homepage, or in their terms and conditions section. 3. Do I Need One On My Website? In 2009, the Federal Trade Commission (FTC) released its ‘Guides Concerning the Use of Endorsements and Testimonials in Advertising,’ which declares that any affiliate using reviews, rankings, or testimonials to promote or endorse products must disclose that they receive compensation to do so. These are designed to inform users of an affiliate’s relationship to a business; you should use this one if you pay someone to review or endorse your products. This includes the Amazon Associates program, which is one of the most popular affiliate programs on the internet. No Attorney-Client Privilege: This states that contacting an attorney via their blog does not create an attorney-client privilege. In other words, attorneys should inform clients that any emails, contact forms, or chats submitted through a lawyer’s site are not confidential. Attorney Advertising: Lawyers must include the phrase “Attorney Advertising” on a prominent page on their site. Some jurisdictions have different requirements; to make sure your site is in accordance with the law, you should check your state’s regulations. Misleading Information: Your attorney advertising cannot contain false or misleading information that would deceive clients. Advertising must be based in fact, and shouldn’t promise specific results or make claims that would lead a client to have unreasonable expectations concerning a case’s outcome. Specializations: Don’t claim or use language indicating you’re an expert in any areas of the law on your legal site unless you are certified by the regulating body in your jurisdiction. Identify Attorneys: Most states require you to identify which attorneys are responsible for the site. This implies that you should also include your firm’s name and address. Liability for Costs: Are your clients responsible for costs no matter the outcome of their case? Whether or not payment is contingent on a case’s outcome is up to you; but you need to clarify on your website what your policy is. 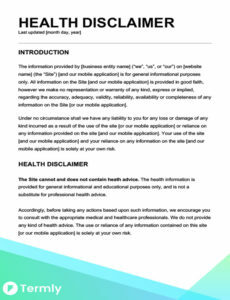 Online businesses or apps that offer medical advice need to notify their users that information contained on their pages is intended for educational purposes only, and should not be substituted for medical advice from a doctor or healthcare provider. 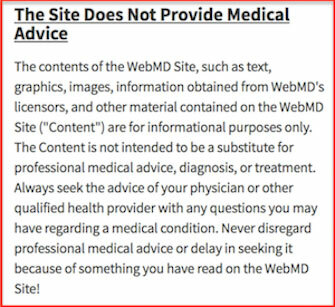 They should also clarify that the use of their site or application does not establish a doctor-patient relationship. Professional blogs or professional service platforms need to clarify that advice and information on their pages is for educational purposes only. 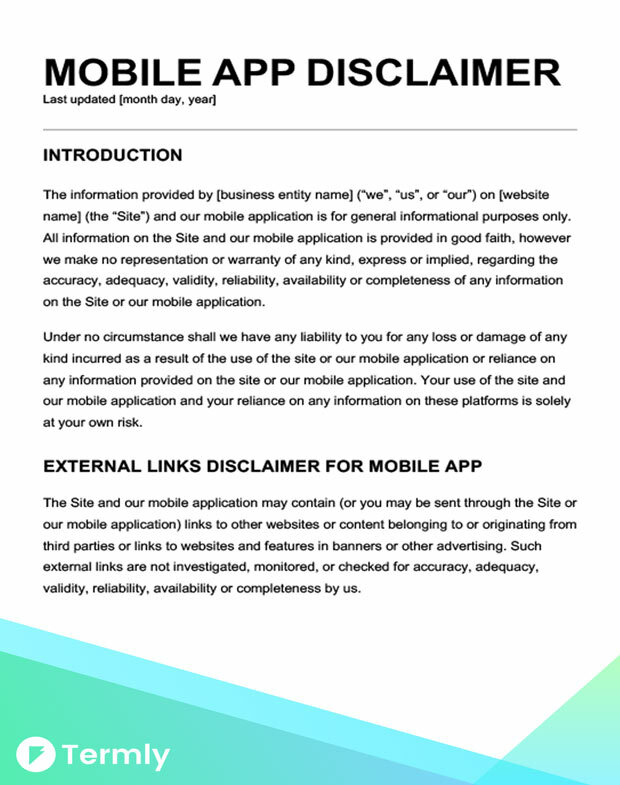 To prevent liabilities, make sure your disclaimer is visible and easy for users to find. If you’re not sure where it should go, most websites include theirs either on their homepage, or as a part of their terms and conditions. 4. How to Write One: What Should I Cover? Accuracy: This states that a business or company is not responsible for the accuracy of the information provided on their pages and cannot be held liable for third-party claims or losses. Comments: This means that a website or application is not responsible for the comments, views, or opinions made by site visitors, and that the site itself reserves the right to use its own discretion when determining whether or not to remove offensive comments or images. Compensation Limitations: Include a statement that limits the amount of compensation that can be claimed against them or an affiliated party. Multiple Content Providers: This is appropriate for sites or blogs that publish articles, guest posts, feature pieces, or opinions from third party contributors. These state that an owner is not responsible for the thoughts or opinions of its authors or third party contributors. Easily Readable: Disclaimers should always be ‘easily readable,’ which means that they should be written in clear, detailed language that is easily understood. They should also be conveniently placed on a main page that is easy for users to find. International: These claim that owner is not responsible for the translation or interpretation of content. Modification: This defines how the content of a web domain or application may be used. In other words, if a third party would like to reuse content, data, or any other information found on a site in any way, they must abide by the terms specified. 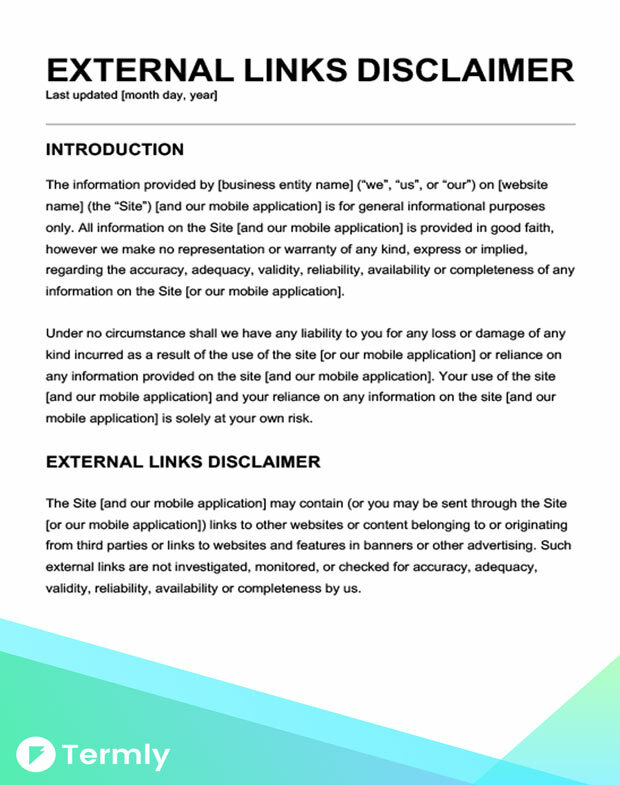 Section Divisions: For companies that find it necessary to list several types of disclaimers, it is essential to divide them into sections so that they are more accessible for users. Third Party: These discuss images or content that do not belong to the site publisher, and state that it may publish third party content without necessarily endorsing it or being affiliated with it in any way. 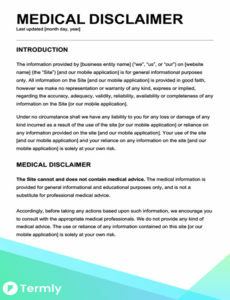 Having trouble figuring out what to say in your disclaimer? The information, products, and services available on your website will determine what elements you need to include. AIMSICD is a mobile application that is designed to detect IMSI-Catchers, which are false mobile towers—or base stations–that interfere with a target mobile phone and its actual service provider. Because this is an experimental app that is still in development, AIMSICD states below that they will not be held responsible if their product fails, for whatever reason, to protect its users. Ebay’s statements are accessible through a link on the site’s main page, but can also be found under the photos and product descriptions of auctioned items. This particular example states that all descriptions of items “should be strictly regarded as an opinion only, with no warranty given nor implied against error or omission.” This protects Ebay from complaints or claims concerning the condition of the products auctioned on their website. Because Lexblog is a platform that hosts legal sites, each site must have a disclaimer. This is a measure taken to prevent clients from misconstruing information provided on any of the Lexblog sites as actual legal advice, or from falsely assuming that contact with a legal professional via their website is considered confidential. Wikipedia’s rich online database relies on the knowledge and expertise of its users to provide information on a vast array of topics. Because Wikipedia gives users access to such a wide range of information–and because there is no way to fact check every piece of submitted content or data–it has one of the most comprehensive disclaimer pages.